P721Q's Student Work Study Program consists of 17 programs which each maintain between 1 and 3 geographically clustered work environments for a total of 53 separate work sites. 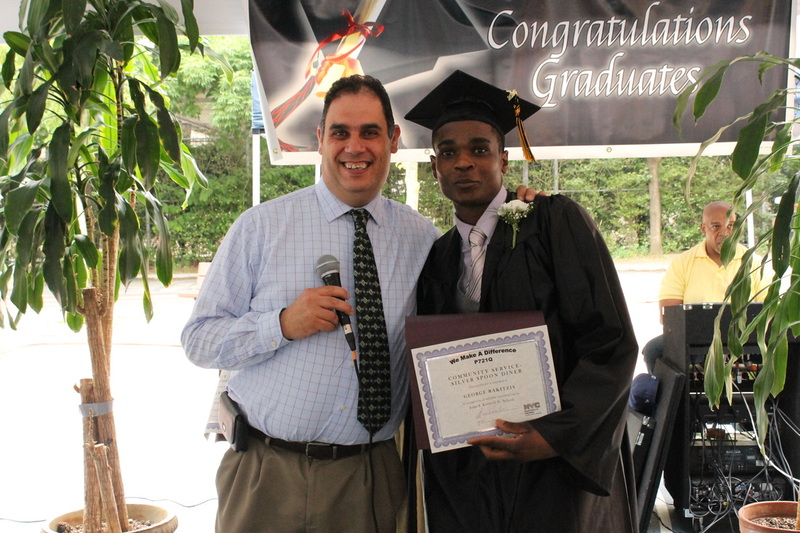 The Word Study Program is headed by our Job Developer, Howard Solomon who can be seen in the picture to the left posing with a 2016 Work Study Graduate. We are an educational organization created to serve the needs of high school age students with disabilities. Our mission is to facilitate the maximum independence possible for each of our students. To that end, in addition to the traditional classroom environment, we also maintain 53 work study environments so that our students can be exposed to the world of work. 721Q recently celebrated its 50th Anniversary! We opened our doors in 1966 as the Queens Occupational Training Center. 5 principals later, our vocational program is still going strong.